EMEC’s clients benefit from a range of ready-made and cost-minimising test and demonstration facilities in major wave and tidal resources. Significant infrastructure investments have been made to make it as easy as possible for technology developers to learn by doing, with full confidentiality of performance data. 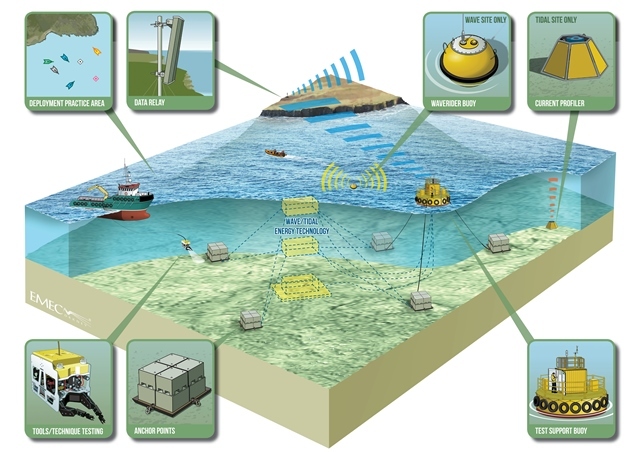 In addition to EMEC’s grid-connected sites, EMEC also offers real-sea test sites in the less challenging conditions of Scapa Flow and Shapinsay Sound. These sites provide a more flexible sea space helping close the gap from tank testing, and acting as a stepping stone towards larger scale projects. Such accessible real sea testing enables marine energy developers and suppliers to learn lessons more cheaply, reducing the need for big vessels or large plant. Bespoke test support buoys can be provided, allowing developers to dissipate electricity generated by their devices and record data. Pre-installed anchor points provide mooring options, and an area of seabed is available for rehearsal or deployment of other tools and techniques. EMEC also holds an overarching site licence, simplifying the consent process within an agreed envelope of activity. There is a cluster of energy, maritime and environmental expertise around EMEC, with a fast developing supply chain providing support to this new industry.